"Don't spill paint on it"
I was playing around with my video camera and some scale models tonight. I wanted to try showing a plane flying over a model railroad scene. I used my WWI layout and a model WWI biplane. Since I don't have real chroma key green screen material on hand, I used green construction paper. It took a few tries, but I ended up with this clip. It was a fun experiment. I suggest you put sound on and watch in HD. The plane movement is choppier on this version. The choppiness could be due to the import from Adobe Premeire Elements 12 to iMovie. The green screen effect in APE12 Mac OS versions are very poor. iMovie does a better job with the green screen, but iMovie doesn't allow simple resizing of green screen elements. No good answer without upgrading to serious programs. For over 24 years I worked as an defense analyst involved in operational testing of US Army military systems, with a focus on combat vehicles and unmanned aircraft. (I wrote a paper a few years ago for CBO about armored vehicle design which you can find here.) As an operational tester I learned the importance of conducting tests of complex systems with real users under realistic conditions. Today during the open house, the USMRR Aquia Line went through its Operational Test 1 (OT1). Before the steady stream of visitors arrived, a crew of volunteers arrived for pre-test training. One of the key tenets of operational testing is that the equipment users must be representative of the actual intended users in the field. In this case, the test crew list reads like a list of ringers, but they are folks that will eventually be operators on the layout. They included a full assortment of military branches and disciplines. Crew one was composed of John Barry and Ben Hom. John is a retired US Air Force C-130 pilot with extensive test experience at USAFOTEC. Ben is a retired navy officer currently working as a contractor for the US Navy Operational Staff in the Pentagon. Crew two was composed on JD Drye and Doug Gurin. JD is a senior analyst at SPA working in nuclear weapons security. Doug is the LDSIG guru and former traffic engineer. 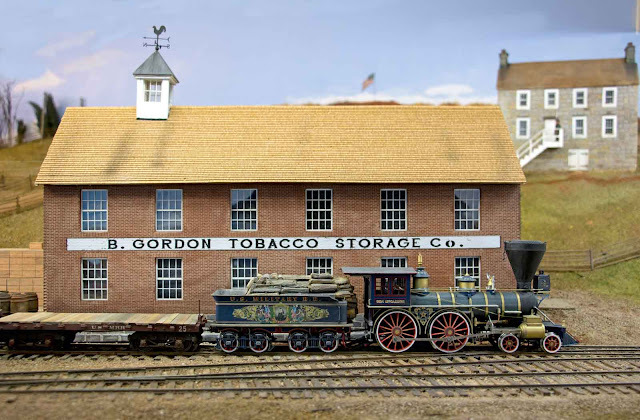 All have extensive model railroad experience in additional to their profession expertise. After being fed by our commissary staff, the crews received a briefing on how to operate the layout, notably what switch stands were having trouble. Other than that, they were instructed to "run the layout however you see fit." I attended to guests and left the operators on their own. The guests filed through and the layout room got quite crowded at several points, but the test crews kept the trains running. Afterwards, they provided me with some feedback. They reported that both battery powered engines had their batteries eventually draw down during the session. The Whiton lasted about an hour and the Fury about 2. Engine McCallum worked well with its standard DCC sound decoders. Two hours would be OK for an op session, but is not long enough for a 3 hour open house. The next DCC engine conversion will be a sound-DCC with a keep alive circuit. I had cleaned the track before hand but McCallums wheels had not been cleaned in a while. The crews were unaware of the prohibition in the rule book about using the extended links on the cow catchers. They noted some wheel tracking issues as they pulled and pushed long cuts of cars with the extended links. The problems stem from the fact that the extended links do not have sufficient angular play to handle the tight curves only layout . So they bind and twist the boilers of the tender driven engines. I have not yet tried to build new extended links with more angular tolerance. So I have a rule about using those links only in emergencies. However, I failed to tell the crews about the rule. However, the rules were posted to the blog here and listed below. Note rule 2.6. Other than those two issues, they did not report any other problems. Overall, it was a successful OT1. The layout is in a state where operating sessions could begin with just a few weekends of work (the military would call it Initial Operating Condition or IOC) . To make that happen, I would need to make it a higher priority. Alas, there are several other higher priority projects that stand before it. So formal op sessions will have to wait a bit longer. With regard to the open house, the 6 minute introductory video is proving very useful. We played it five times today at intervals so that most guests got to see it. About 30 guests stopped by including a former colleague and spouse from IDA and a current colleague and his family from CBO. 2.1. You are in charge of the train. You will instruct the engineer and brakeman on what to do. 2.3. In the packet you will receive a replica copy of the USMRR Conductors Report. Please fill out the top with the names of the operators on the train. This form will act as your switch list. It will tell you how many cars are in your train (probably 4) and where they should be spotted. It will also list cars that you must pick up. You should verify that the cars you are pulling are correctly listed on your sheet. Make any corrections as needed. 2.4. Any cars not listed on the papers but found at the terminal must remain in place though they can be shuffled around if necessary as long as they end up where they started. 2.6. Do not use the extended link on the cow catcher for switching. Make all your switch moves from the rear of the tender. 2.7. Your train should display proper signals. In daylight, white flags for a single scheduled train or red flags if an extra is following. At light, signal lights will be used instead of flags. 3.1. You are in charge of the locomotive. You will control the throttle, bell, head light whistle and engine servicing. Please familiarize yourself with the throttle and the special functions. 3.2. You do not have to run with the headlight on in daylight, but you may if you wish. 3.3. Ring the bell when passing or near the depot. 1 Short - Apply brakes2 Short – Release brakes3 Short – Backing train4 Short – Call in flagman, 5 Short – Wood up1 Long – Danger. 3.7. To service the engine you must park by the wood rick and water tank to replenish water and fuel. Use the sound effect function to simulate the water filling operation. You do not need to move the hose or lever on the tower. Wood loading is simulated by a 2 minute wait by the wood rick. You do not have to actually load the wood. 3.9. You will turn the engine when necessary on the turntable. It is manually operated and aligned. We will handle turning the engine on the fiddle yard cassette. 3.11. If the engine stops running during operation, it could be a dead battery. Please let us know if that happens and do not continue to operate. We have a spare engine in case this happens. 4.2. The cars use link-and-pin couplers. We use magnetic pins and laser-cut paper links. They will take two hands to operate. You will be given a brake staff to use. It has a rare earth magnet on one end to grab the pin and a taper on the other to help manipulate the link. Use the magnet end to pull and place the pins. If you are careful the magnet will only grab one pin when you go to pull the pin on adjacent cars. If you accidently pull two pins, replace the one you did not wish to pull. Lance Mindheim is admiring Jim Lincoln's P48 models. This morning Paul Dolkos and I drove to the MARPM in Falmouth, VA in the Alkemobile. 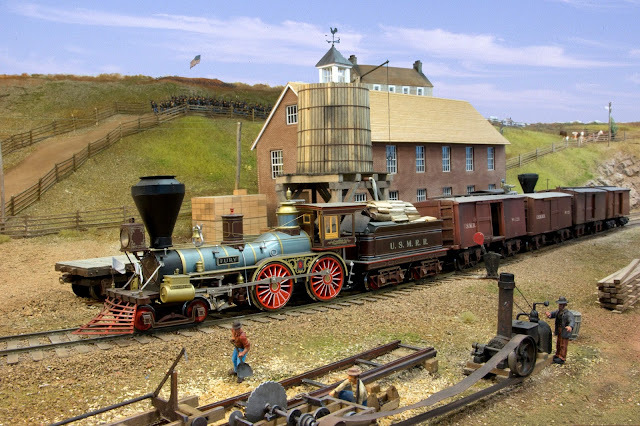 Paul presented a talk about the amazing variety of railroad action in Virginia. He showed an incredible assortment of Kodachrome slides from numerous locations in Virginia. They dated from just after WWII to the end of steam. The slides were amazing, even if the projection system at the hotel was not so good. I did my talk on getting published. It seemed to go well. As usual in an RPM, it was fun to meet everyone and talk model trains. Norm and crew did a nice job. Brian and Jill visiting the Aquia Line. Later that evening Brian and Jill Bollinger from BEST Trains visited our house to show the diorama he built for the museum and to see my layout. They are on the way to South Carolina to deliver the diorama. We had a great time comparing notes. Alicia even made some brownies to sustain us. Brian did not bring in the complete diorama, but he did show us the bridge he built. As you can see in the picture, it is a big model. Very nicely done. There are thousands on NBWs on the bridge. He had high school kids help install them. assembly when he gets to the museum. Tim showing his artwork while AW looks on. Timothy Harrison, co-host of the Model Railcast Show, stopped by the house tonight on his way to the MARPM. Tim brought the pencil artwork he did based on a picture of my daughter, Danica. The photo was from one of Danica's photo shoots. Danica is probably the only fashion model in the world that also has a model railroad article by-line. 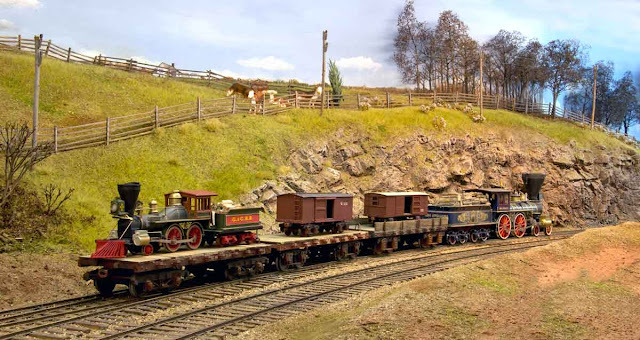 She wrote an article for N Scale Railroading several years ago. Tim posted a video of the drawing being made here. about it for N Scale Railroading. the operators from the Atlanta 2013 NMRA meet. Afterwards, Tim got an introduction to the layout and had a chance to run a train both as a conductor and as an engineer. Falmouth with work at Potomac Creek and Brooke. The layout is getting real close to being able to host operating sessions. It is just a matter of adding some staging and building a few more cars. The 2015 MARPM is rapidly approaching. The Norm and his crew have a good slate of clinics lined up. I will be doing a talk mid-morning Saturday. 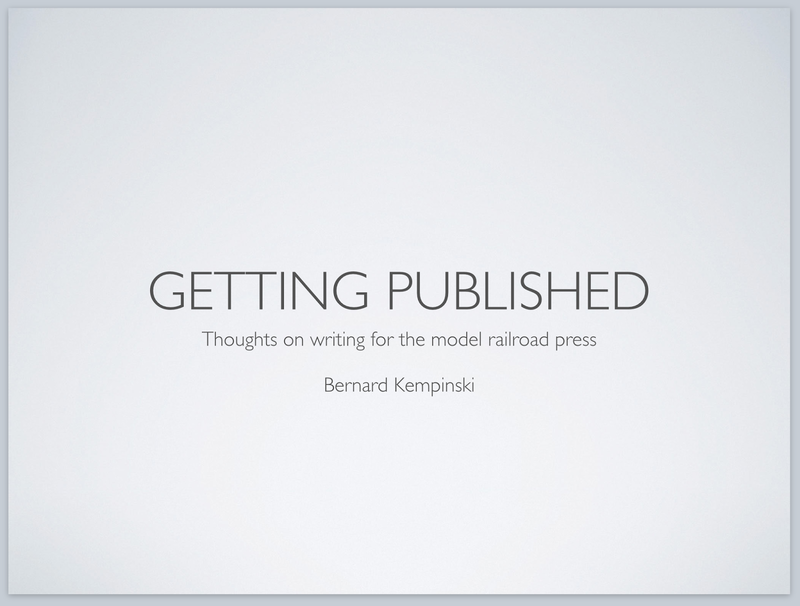 The topic will be "Getting Published, Thoughts on Writing of the Model Railroad Press." 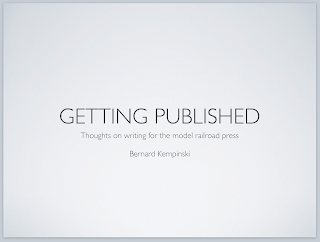 This is a new talk that combines an earlier speech I did, plus a detailed explanation of model railroad photography techniques. 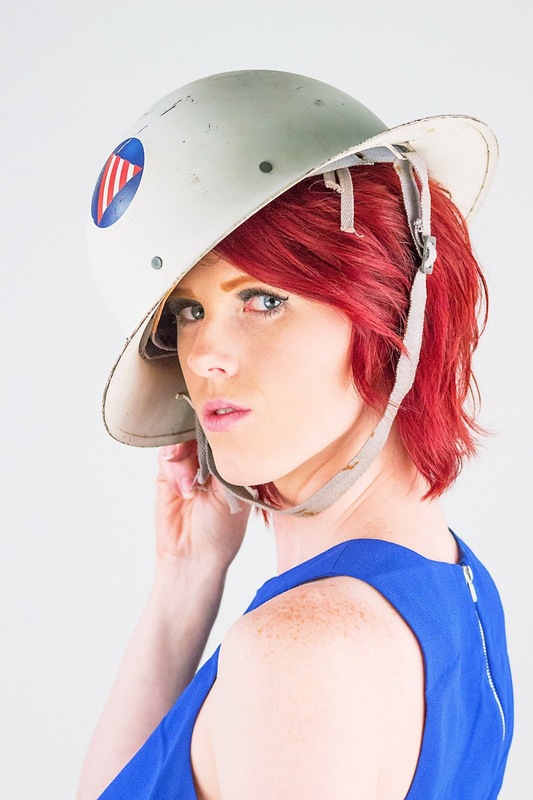 The meet also includes a display area for models and a vendor area. On Sunday, my layout and Andy Dodge's P48 Colorado Midland, will be open for inspection for attendees of the MARPM meet. boxcars this week. The cars are for a diorama for a museum in South Carolina that Brian Bollinger of Bollinger Edgerly Scale Trains is building. 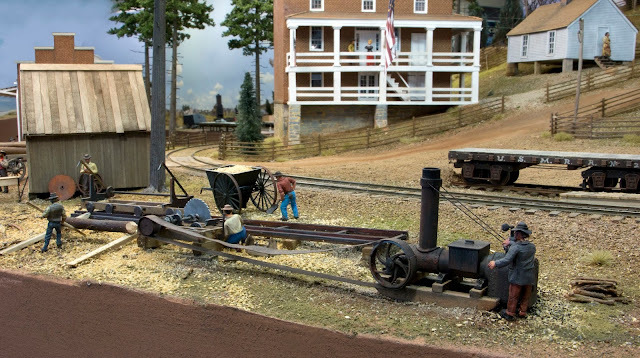 The diorama depicts an incident that occurred right after the civil war. The diorama required two box cars and a locomotive in HO scale. He subcontracted the task of making these to me. The cars are laser cut kits. One from BTS and one from Alkem Scale Models. New cow catcher pilot and removed motor mounts. The locomotive is a modified Mantua General, I did some work to improve its appearance and added detail to it. Since this will be a static model, I removed the motor and gear train. I also removed the weight that fills the cab. With the weight removed, the cab doesn't look too bad and I used it as is. The boiler and firebox needed a lot of polishing and sanding to remove flash and surface roughness. I added an extension to the boiler to fill in a gap that was visible with the motor removed. New tender deck still waiting for the water fill port. I cut off the pilot and added a brass casting from Cal-Scale. The tender took a lot of work to remove the unrealistic wood pile. I added a new deck and water fill port. With the metal ready, I primed and painted the model. I added some details to the exterior, such as a simulated valve rod, new laser cut locomotive name plate, a micromesh cinder screen in the stack, a photo etched builder's plate from Al Mueller at Delafield Works, a new pilot truck from Dave Hoffman, and a wood pile made from small pieces of actual sticks. 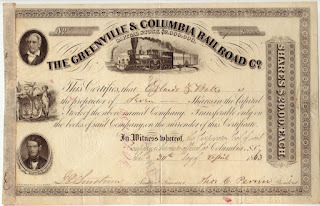 Brian did not know the actual name of the locomotive involved in the incident, so we went with "Velocity," a Rogers built loco in service on the G&C RR. Oh, to answer the question, no I'm not changing scales. 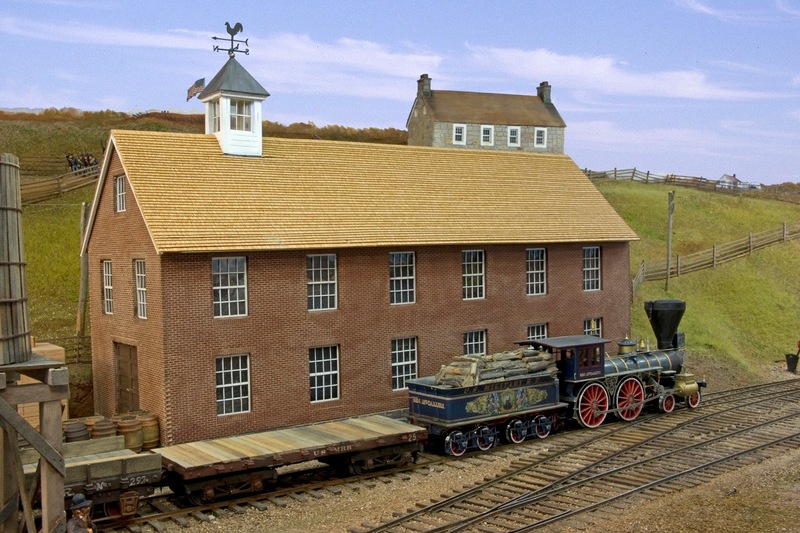 The USMRR Aquia Line still lives in O Scale. But this was a fun foray into HO Scale. Is this a new photo found in the National Archives? I spent the past few days working on layout room infrastructure, mostly adding a new floor surface and skirts. But before I could do those tasks, I spent a good part of an afternoon sorting through the boxes of tools and stuff under the layout. After purging about half of what was there, I proceeded to add the new floor. I used Allure Laminate flooring, the same as in the rest of the basement. It is water resistant and fairly easy to install. The toughest part was having to jack up the layout one leg at a time to allow clearance to slide the laminate planks under the legs. Each leg had small sections of the old flooring under them that I removed when I jacked up the legs. So the change in height due to the new flooring material was minimal. It did take some courage to pump the hydraulic jack, fearing that the layout would spring apart. But it all seemed to go well. No real apparent damage occurred except for some ominous groans and creaks. I am using the layout skirting from McCooks Landing. Since I only have 12 linear feet of the panels with the bunting, I need to get my mom to sew some new ones, once her leg heals. CINCHOUSE (Alicia) likes the new look, though she did admonish me to, "don't spill paint on it." When I started building this layout, I told her to not worry about some of the closet space that I was removing. I said, "There will be infinite storage under the layout." Well I was right. With the purge and shelves under the layout, I only need half of the square footage under the benchwork for storage. With this addition, the layout from Brooke to Falmouth is nearly complete. All that remains is detailing. No new structures are needed, though I do need to make a conductors car turned into a telegraph shack for Stonemans Station. This week we had two accidents. One was not too happy. It ended up with 26 stitches in my mom's knee. She is recovering about as well as can be expected and is in good spirits. War-time Atlanta - note mosts signs have black letters on light backgrounds. The other was not as serious and fortunately ended up with a happy outcome. I painted the sign on the Tobacco Prizery using a white background with black letters. 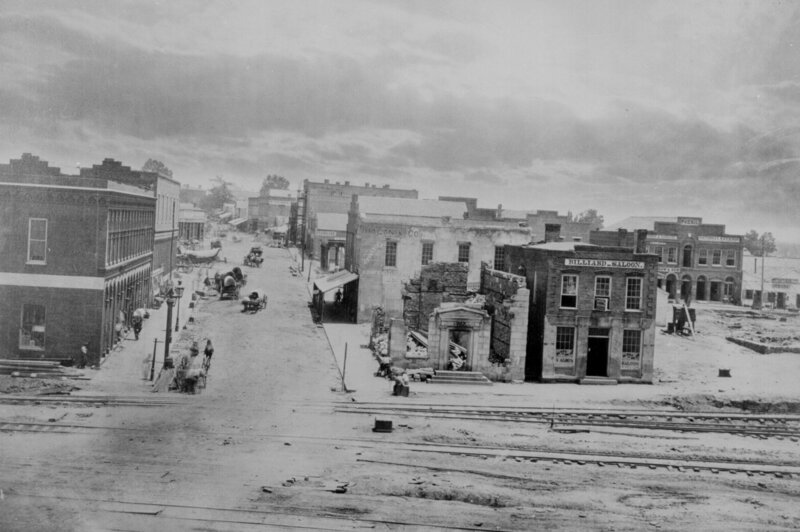 A survey of antebellum and ACW era photos shows this was the most common style of painted signs on buildings. I used a laser-cut stencil with two sided tape. As I was peeling back the laser-cut stencil, some of the white acrylic paint background came off. The effect was that of peeling paint. It looked authentic, so I did not touch up the peeled spots. A happy accident! I did a little research to find a typical name. 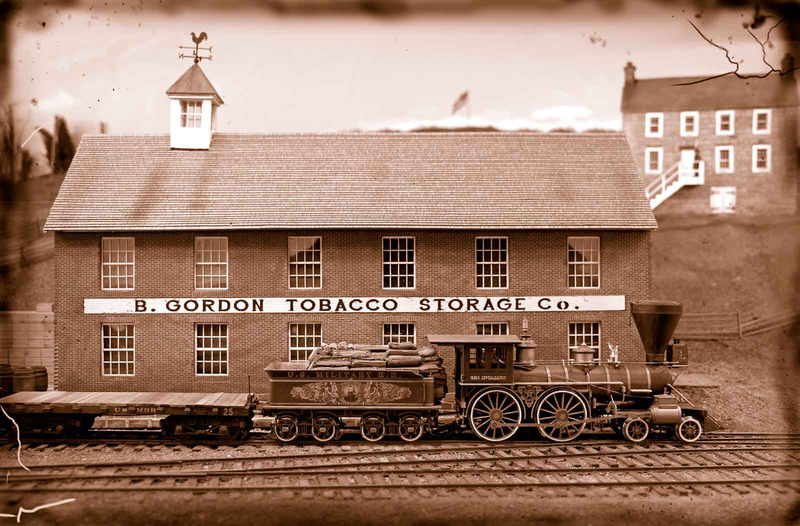 I went with B. Gordon Tobacco Storage Co. Bazil Gordon, had factories and warehouses in Falmouth VA where he exported tobacco and cotton. According to Wikipedia, "In 1847, Bazil Gordon had died: At the end of his life, when he had finally finished accumulating wealth, his net worth was estimated in the millions, which, for the time, was large. By 1847, no other American had recorded a financial worth over a million dollars; it is for this reasoning that Gordon is believed and known for being the first millionaire in America." Engine Fury takes water at Brooke. I added the loading platforms to the Tobacco Prizery tonight. I also made some station signs for the fascia. I thought I would take a few test photos with my DLSR to see how the scene looks. It is almost done. Close up of the boiler. Not the engraved rivet detail on the backhead. New station signs on the fascia- they are laser engraved and cut. The next question is, should I paint a sign on the factory similar to this one in Danville, VA? It's tough to remember you came to drain the swamp when you are up to your neck in alligators. A open house in a few weeks, and a tentative future visit next month by Kalmbach Video Plus to video record my layout made me decide to rearrange some priorities. At the top of the new list was to get some more work done on Brooke. I completed a bunch of tasks in pursuit of that objective over the three-day weekend. The highlights include nearly finishing the Tobacco Prizery, installing the saw mill and scratch built steam engine, installing the sawyers's work shed, installing the water tower, touching up most of the figures to fix damage from handling, adding grass and scenery to the area near the tunnel portal, finishing installing the split rail fences, and making a sign for the Spotswood Inn. 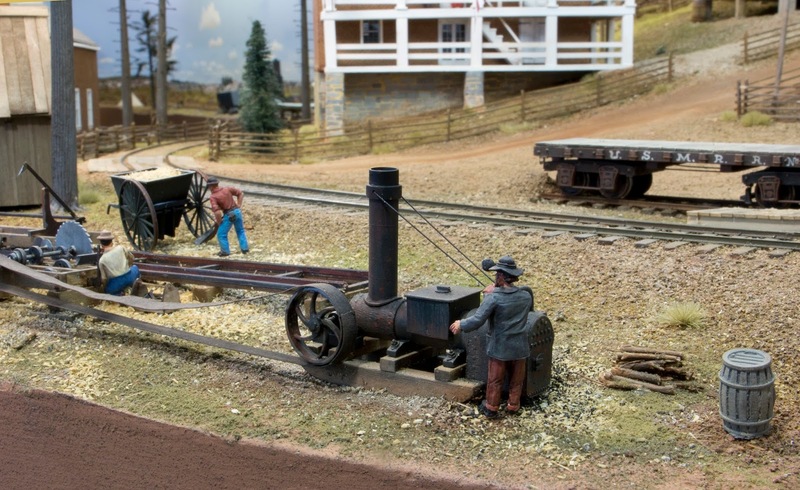 The steam engine is skid-mounted with an external drive wheel. I based it on a photo of a similar engine shown in one of Andrew Russell's photos in Alexandria. I believe the tank on top is for water. Most of the parts were laser cut except for the steam dome. The dome I turned on my lathe. I could not spot a governor on the engine in the photo, and I forgot to add the valve control rod, but otherwise I am pleased with how it came out. The saw mill is recycled from McCooks Landing. Since it was inside a background building on that layout , it was not very detailed. I need to add some of the pulleys and other controls for the slide now that it is in the foreground. Haupt mentions in his memoirs installing a saw mill to cut lumber for the bridges, but he did not specify where the saw mill was located. I put it at Brooke as it was the place where I had the most level ground other than at Aquia Landing. The flag is another McCooks recycled item. I added it to the Inn via a hole drilled in the center column. This shot shows some of the scenery installed near the tunnel portal. The tall trees help block the view across this portion of the layout. I installed the pine tress and added roots with Miliput. I added a lot of static grass and other scenery items to embellish the open fields near the inn. The dried looking flowers are Silfor autumn golden rod. Some of the new fencing is visible in this shot. The brick mill is a Tobacco Prizery. It is based on a similar building in Brooklyn, Va, a tobacco factory in a rural location. I added the cupola and weathervane to jazz it up a little bit. It still needs to be installed in its site and have loading docks added to it. The water tower also came from McCook's Landing. I love how it fits in that spot. The oxen are recycled from McCooks. I swapped out the boiler on the wagon with some logs for the saw mill. The saw mill is in the foreground. I may need to install a plexiglass shield to protect it against wayward elbows and sleeves. Anyone who has been to U.S. Army Airborne School knows what the phrase, "hit the hole pole man, hit the hole!" means. After reciting that phrase over hundreds of pushups, it is indelibly etched into my mind. So it is not surprising that as I finished installing the last 36 telegraph poles on the Aquia line, that phrase popped into my head over and over. When I made the first batch of telegraph poles in 2011, I used custom made brass turnings for the top-hat insulators. 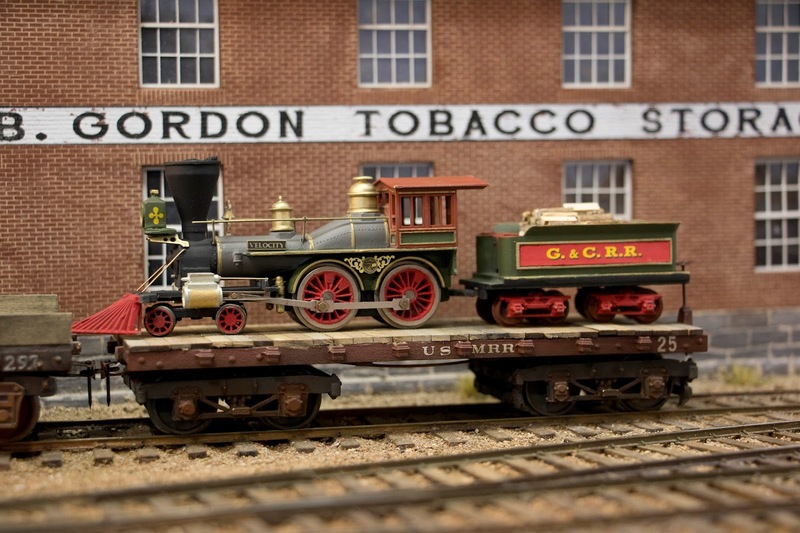 But a few years ago, I noticed that the nylon axle bushings that Tichy offers for HO truck frames were the perfect size to act as O scale top-hat insulators. To speed the construction of the insulators process, I decided to laser cut the wooden pegs that hold the insulators to the poles, instead of shaping each one by hand. I was able to make quickly the 72 insulators I needed plus a few spares. I spray painted the insulators a flat black color. Then I glued the pegs into the holes in the underside of the nylon bearings with CAA. Once the CAA set, I trimmed the insulators from their frets and glued them to the poles. hammering in the 16D Nail to make pole holes. To make the poles I selected an assortments of stalks from weeds I collected a few years ago. Alas, the city has redeveloped the field where I used to get these stalks. It remains to be seen if any will be available for harvesting this winter. I glued the pegs to the poles with CAA. Once they were set, I gave them a wash of black, gray and tan to hide any shiny glue residue. I planted them about 16 inches apart. I introduced a little forced perspective by shortening the poles and planting them closer together in places where they moved away from the viewer. With the poles in place, I added the green lycra E-Z Line from Berkshire Junction to simulate the wires. This is an amazing product as the line is very flexible and can withstand a lot of abuse. Nonetheless, I managed to break the lines twice during install, perhaps because I used the fine wire, which is about two microns thicker than gossamer and is very hard to see, especially with bifocals. Also, be very careful with CAA near this line as it seems to set very quickly when it touches the lycra. The completed pole line gives the layout a closer to finished look and helps tie the disparate scenes together. It adds an interesting man made element to the areas of the layout that are otherwise open country. Next I added some foliage to the area above the tunnel portal. The purpose is to help screen the view when one looks past Brooke to Falmouth and the entrance to the layout. The large tavern and the "cedar trees", and tall pines do a pretty good job or breaking up the view. I also was able to add some LED under cabinet lights in the staging area in the closet for the PoLA layout. Seeing this blank wall makes me want to add some kind of backdrop behind the staging tracks.